The Academy of Arts and Knowledge aims to be Fort Collins premier performing arts school, providing our students with a fantastic learning environment that focuses on arts, creativity, and self-expression. Contact us today to learn more about our performing arts elementary school in Fort Collins. In our previous blog post, we shared a few ways that you can help your child to continue learning over the summer. There’s no such thing as too much learning, however, so here are a few more helpful examples of things you can do to help your child continue learning this summer! The school year can be a busy time for kids, from not only the daily routine of being in class, but also the extra curricular activities that the school year can bring. While some parents look at summer as a time for their children to simply relax and do little beyond hanging around the house, this free time can be used to your child’s advantage. 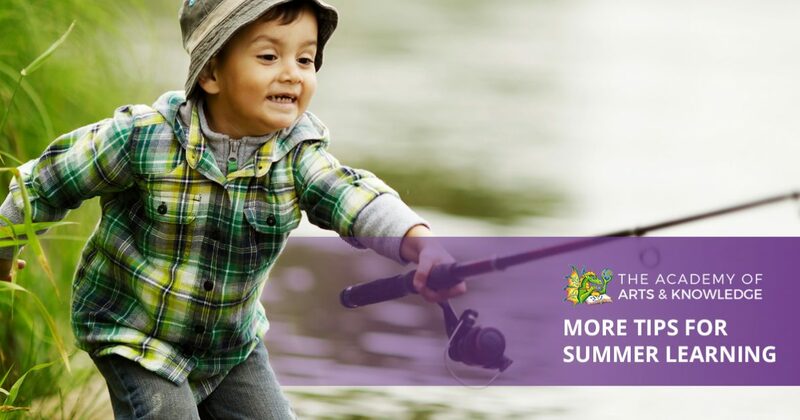 With more time on their hands, summer is a great time for your child to pursue a new hobby or interest, as they’ll be able to dedicate more time to it than if they were to do so during the school year. Help your child determine what new skill or hobby they’d like to develop over the summer holiday. Maybe they want to learn how to do something creative like drawing, learning an instrument or pottery. These are all great hobbies to pick up, and the process of developing the new skills required to grow this hobby are a fantastic way to ensure that your child’s mind will stay sharp over the summer. The process of learning a new skill can sometimes be frustrating, especially with little to no previous experience, but the open schedule and laid-back mood of summer will make for a far easier learning experience overall. When your child returns to school in fall, they’ll be able to share their new skill with their classmates and teachers! Whether planning for an upcoming party or simply doing the weekly grocery shopping, summer is a time where many trips to the grocery store are made. How many times have you gone all the way to the grocery store, only to realize upon your trip home that you forgot something that you needed? While this has certainly happened to all of us, a great remedy to this situation and an equally fantastic way to keep your child learning over the summer is to put them in charge of your next shopping trip! Help them make a list of all the items that you need to purchase, having them cross off each one at the store as you go. Have them keep track of the price of each item, as well as any savings that you may encounter on your trip. This not only helps them with organizational skills and math, but it also shows them the basics of grocery shopping. By the end of summer, your child may never want you to go grocery shopping without their help! Those are just a few more great examples of ways that you can help your child continue learning over the summer. At The Academy of Arts in Knowledge, we are committed to providing our students with the finest performing arts curriculum in Fort Collins, creating an environment that encourages their growth and development. To learn more about our Fort Collins performing arts school, get in touch with us today!